Uber could use something warm and fuzzy to soften its reputation. But who would have expected the company to go so literal? In a cross-promotion for Animal Planet's Super Bowl lead-up, the Puppy Bowl, Uber has partnered with shelters in 10 cities to deliver puppies on request. 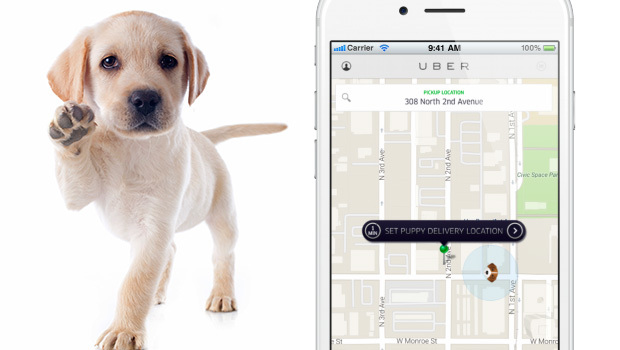 Uber users in Atlanta, Baltimore, Cleveland, Dallas, Washington, DC, Indianapolis, Los Angeles, Phoenix and Seattle can open the app and navigate to the "puppies" option to request a visit in the same way they'd order a cab. Fifteen minutes of "puppy playtime" costs $30, which is donated to the animal welfare organizations. For those who want to get their P.O.D. (puppy on demand) at the office, Uber suggests making sure that "your boss or building is going to be cool with the woofs and that no one in the area is allergic." The doggy delivery option is available on the app Wednesday from 11 a.m. to 3 p.m. Most of the animals are up for adoption.